When 29-year-old Effie Wu tried to buy a ticket in Beijing for the latest Indian comedy 102 Not Out over the weekend, she was surprised to find that there were no showings near her home even though the film had just released in the Chinese mainland on Friday. Given that Indian movies have been experiencing something of a revival since Indian sports film Dangal earned a whopping $193 million in China in 2017, it seemed strange to Wu that 102 Not Out had not even been given a single screen in her neighborhood in its first weekend out. Actually the film enjoyed a 14.2 percent screen share on its debut day, but this dropped to 10.9 percent on Saturday and 9.4 percent on Sunday. As to why the film saw such a significant drop, some Chinese film industry analysts have put forward a theory: Chinese moviegoers aren't interested so much in Indian movies themselves than they are in big name Indian stars such as Dangal star Aamir Khan. 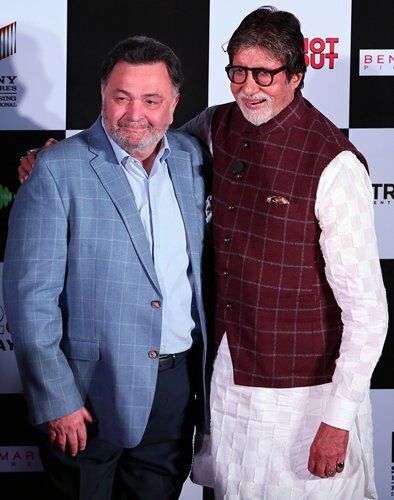 The story of 102 Not Out follows a 102-year-old father Dattatraya Vakharia (Amitabh Bachchan) and his 75-year-old son Badulal Vakharia (Rishi Kapoor). While the father has a young heart and is determined to become the world's oldest man some day, his son lives a lackluster life and is indifferent to everything. Dattatraya starts to consider whether he should send his son to a nursing home. While the film is mainly a comedy, it also touches upon social problems concerning the elderly. For example, Badulal worked hard to send his son Amol (Dharmendra Gohil) to the US to pursue his studies, but now Amol seldom returns to India to visit his family, nor does he allow Badulal to visit him in the US. This led to Badulal's wife, who suffered from Alzheimer's disease, to pass away without seeing her son one last time. As far as Badulal is concerned, Amol is just waiting for his father and his grandfather to pass away so he can enjoy his inheritance. Depicting social topics that invoke emotional resonance is considered to be one of the key factors behind the success of previous Indian movies in China. In China, where family and the elderly are highly valued, 102 Not Out definitely has all the elements that should be able to strike a chord with the Chinese audience; yet it has failed to do so. According to estimates from Chinese ticketing platform Maoyan, the film only made 22.66 million yuan ($2.3 million) over the weekend. The main reason is that while a great movie can spark discussion about social issues, a movie does not become great just because it tackles social issues. 102 Not Out is, after all, just an average film. It currently has a 7.5/10 on IMDB and a 7.3/10 on Chinese media review site Douban. Also taking into consideration its release meant the film went up against Hollywood blockbusters like Venom and Fantastic Beasts: The Crimes of Grindelwald, and similar Chinese comedy A Cool Fish, its dismal performance is not at all surprising. Another nail in 102 Not Out's coffin is that while it tries to tell a heartwarming story about a new group, elderly people, the story, at its heart, is not very different from other recent Indian films shown in China that tell heartwarming stories about a father (Dangal), a mother (Secret Super Star), wife (Toilet: A Love Story) and daughter (Bajrangi Bhaijaan). When PK (2014) and Dangal first screened in China, heartwarming Indian films that tackled certain social issues were still something of a novelty for Chinese audiences. But now the market has become oversaturated with them. Nine Indian movies were imported into China this year alone, while previously only one or two Indian films a year was the norm. While this is not the first time that Indian films have found success in China - films such as The Tramp (1951) and Caravan (1971) are remembered fondly by many older Chinese - the sudden rise in popularity for Indian movies today has more to do with the star power of one individual: Aamir Khan, who Chinese fans endearingly call "Uncle Mi." Khan stars in two of the top five highest-earning Indian movies in China. While Dangal has been his biggest financial success in the country, the roots of his popularity in China actually go back much earlier. In December 2009, the star's 3 Idiots was released in India. Making its way to the internet over the following months, the film quickly won the hearts of many Chinese netizens. As the star's profile in China increased, his new fans there began digging through his back catalog such as Qayamat Se Qayamat Tak (1988), Khan Rang De Basanti (2006) and Taare Zameen Par (2007). On Douban, Taare Zameen Par has more than 100,000 reviews. So when Dangal came to China in 2017, Khan was already a very familiar face to many Chinese moviegoers. With Dangal, Khan altered Chinese audiences' view that Indian films are simply platforms for lengthy song and dance routines. His success with the film was also a success for Bollywood as it opened the door for Indian films in China, but these latter films have mainly just ridden on Khan's coattails. But it looks like this free ride is coming to an end as importing the same type of Indian movies to China is simply not going to work anymore. If distributors want to see further success, they will have to do so by changing things up. Fortunately, more than 2,000 films are produced in India each year, meaning distributors in China have a huge pool from which to draw quality films. While finding these films may mean spending more time and money, it will benefit the industry as a whole over the long run. Two other Indian movies, Padman and Thugs of Hindostan, are set to enter Chinese theaters this month. Their success or failure is sure to serve as barometer to see if the fever for Indian films has finally cooled off.